Newton’s cradle was named after Sir Isaac Newton because it demonstrates some of the physics laws discussed in his work Philosopiae Naturalis Principia Mathematica in 1687. It is a device used to demonstrate conservation of momentum and kinetic energy. It consists of a series of identical balls (usually five or seven). Each ball is attached by two strings of equal length to a horizontal frame. This series of balls is arranged so that they barely touch each other. Watch the video below; then, in your science notebook, answer the following questions. Describe what happened when a metal ball was pulled away, released, and then allowed to collide with the four stationary metal balls. What happened when two metal balls were pulled and released? Three? Four? Write a prediction of what you think would have happened if the metal balls were of different sizes and weights. Watch the short videos of six different collision scenarios. Then, in your science notebook, answer the questions found at the bottom of this page. Describe the collision between the moving cart and the stationary cart in the videos from Set A. How do you think the mass of the stationary cart affected the collision? Describe the collision between the moving cart and the stationary cart in the videos from Set B. How do you think the mass of the stationary cart affected the collision? Compare the collisions of the carts from the Set A and Set B videos. wherein p is the momentum, m is the mass, and v is the velocity of the object. One of the most important laws in physics is the Law of Conservation of Momentum. This law corresponds with Newton’s Law of Action and Reaction, which states, “For every action, there is an equal and opposite reaction.” We usually associate the Law of Conservation of Momentum with colliding objects; hence, it can be stated, “In an isolated or a closed system (no external force in the system), the total momentum of two colliding objects before the collision is equal to the total momentum of the two objects after collision.” This tells us that the momentum in an isolated or a closed system is conserved. Watch the videos of real-life application of the Law of Conservation of Momentum. 1. In the first video, when the two men in the cart pulled the rope, they met in the middle. Explain what would happen if the mass of the man on the left were twice the mass of the man on the right. 2. Compare the momentum and the velocity of the medicine ball with the person who threw the ball in the first part of the second video. 3. Explain what happened to the total momentum of the system after the person caught the medicine ball thrown to him in the second video. 4. An 18-wheeler and a pickup truck had a head-on collision. A. Which of these two vehicles experienced the greatest force of impact? Provide an explanation. B. Which of these two vehicles experienced the greatest amount of momentum change? Provide an explanation. C. Which of these two vehicles experienced the greatest acceleration? Provide an explanation. 5. On their way back to school from a field trip, Barry and Ivan were seated in the front row of the school bus and witnessed a bug spatter onto the windshield. They started discussing the physics behind what happened. Barry argued that the momentum change of the bug is much greater than the momentum change of the bus because there was no noticeable change in the velocity of the bus compared to the obvious velocity change of the bug. Ivan disagreed and explained that both the bug and the bus experienced the same momentum change. With whom do you agree the most? Explain why you agree with one and not the other. As previously mentioned, Law of Conservation of Momentum is usually associated with colliding objects. During collision in an isolated or closed system (no external forces involved), the total amount of momentum of the two colliding objects prior to collision is equal to the total amount of momentum after they collide. To further investigate the Law of Conservation of Momentum, complete the Momentum and Collision Simulation Lab. Download “Momentum and Collision Simulation Lab” from the Related Documents, and then click on the picture below to complete the investigation. Before starting the simulation lab, click on More Data to show the mass, position, velocity, and momentum of the balls. Take the quiz to check your understanding about the Law of Conservation of Momentum. This resource is a collection of interactive materials, videos, and other digital media assembled in a conceptually scaffolded 5E lesson format. It provides alternative or additional tier-one learning options for students learning about conservation of momentum—IPC TEKS (4)(E). The assignments require student participation with self-checked and teacher-checked formative assessment opportunities. For example, after students record observations and data in their notebooks, they may be prompted to be prepared to share their answers with the class. Review the resource before assigning it to your students to check for prerequisite knowledge, differentiation needs, and student follow-up requirements as necessary. Students will need a science notebook or something similar in which to record their responses. Describe what happens when metal balls are pulled up and released in Newton’s Cradle. Students may investigate an actual Newton’s Cradle. Students may use a ruler and marbles to model Newton’s Cradle. Collisions Explain the effects of the mass of an object during collision and how it relates to the Law of Conservation of Momentum. Provide a real-life example of collision of big and small objects. Discuss the relationship between the mass and velocity of two colliding objects. Calculate the momentum of two objects before and after collision. Calculate other examples of the problem using the Law of Conservation of Momentum equation. 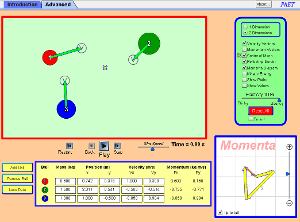 Complete the table of the Momentum and Collision Simulation Lab activity, and answer all the questions from the activity. Self-check using other sample problems from a different scenario. Explain the Law of Conservation of Momentum, and solve momentum problems using the equations from this activity. When a metal ball was pulled away and released to collide with the stationary balls, the last ball from the other end bounced off from the other balls. When two balls were pulled away and released, the last two balls on the other end bounced off, and so on. If the metal balls were of different sizes and weights, they probably would bounce off less or maybe not at all. After each collision, the moving cart bounced off the stationary cart (cart moved in opposite direction). The greater the mass of the stationary cart, the slower it moved away (bounced off) from the moving cart. After each collision, the moving cart stuck to the stationary cart (carts moved together in the same direction). The greater the mass of the stationary cart, the slower the two carts moved after collision. In Set A, after each collision, the carts bounced off from each other. In Set B, after each collision, the carts stuck to each other. According to the Law of Conservation of Momentum, even if the mass of the man on the left were twice as much as the mass of the man on the right, they would still meet in center when one or both of them pulled the rope. The momentum of the medicine ball and the person who threw it are equal. The ball has greater velocity because it has less mass, whereas the person who threw it has less velocity because he has greater mass. The total momentum of the system after the person caught the medicine ball remains constant. The mass of the medicine ball and the mass of the person were combined, resulting in a slower velocity of both of them compared to the velocity of the ball alone. A. The 18-wheeler and the pickup truck experienced an equal amount of force of impact. B. The 18-wheeler and the pickup truck experienced an equal amount of momentum change. C. The pickup truck experienced greater acceleration because it has less mass than the 18-wheeler. I agree with Ivan. Regardless of their sizes (mass), the momentum changes experienced by the bug and the bus are the same according to the Law of Conservation of Momentum. The total momentum of the planet and meteorite will remain the same before and after collision.